Incorporation of The Woodlands Township- Sooner or Later? I am not opposed to incorporating sooner than the City of Houston requires (2057) if we do so for the right reason, do it smartly, with minimal risk, and at the lowest possible cost to the taxpayers. But the decision to incorporate is about more than simply “calling an election.” The decision to call an incorporation election should be viewed as a well thought out business decision, one that considers all the complexities, taxpayer risks and the cost of making such a decision. A poorly thought out decision will put our community, as we know it today, at risk. Today, our unique “Township” form of government, technically a “Special District,” provides a broad range of essential services not provided by our County and does so at a relatively low cost. We have a very efficient alternative form of government. So why incorporate until we are forced to do so? If not threatened by annexation, what factors would justify the complexity and cost of becoming a city? Will the residents be willing to pay a higher tax rate to incorporate? For what additional services? Incorporation will deliver even fewer County services than we receive today but with no lower County taxes. These are areas where many will have opinions, often differing from one another. Normally the decision by voters to incorporate is all about WHY, WHEN and then HOW? The “HOW” is normally considered the least complex as the process is well-defined in the Local Government Code. Unlike the questions of WHY and WHEN, there cannot be widely differing opinion as to the HOW, which is largely defined by state law and the Township’ enabling legislation. In order to incorporate, The Texas Constitution requires a General Law City, the most restrictive of any municipal government, to first be created. There is no other form of municipal government available to us to start this journey. In Texas, there has never been a community of our size that has ever been incorporated. Although the Constitution requires a General Law City to first be created, the Local Government Code restricts the initial population of such cities to between 600 to 10,000 people. Would this inconsistency provide a basis for an adjacent city to challenge our election and, if found invalid, then proceed to annex us? Our Enabling Legislation allows the Township Board to call an incorporation election (normally done via petition to the County Commissioners Court) but provides no clear path to create a New City and dissolve the existing Special District (The Township). By law, a Special District cannot be dissolved until it has retired all of its debt. Until the Township is dissolved the New City has no capability to capture any Sales or Hotel Tax revenue to fund itself. Incorporation does not magically convert the Township to a New City. No, a New City must first be created and then the Township must be dissolved. There is no escape to having both entities in place for some period of time. The question is for how long and at what additional costs? The Township was granted many special privileges regarding the flexibility in its use of its Economic Development and Hotel Taxes. We even have a higher Hotel Tax (the 2% Supplemental Tax) than any city is allowed. Will the legislature be willing to extend these same benefits to the New City? This is not at all certain and in some cases, such as with the Hotel Tax, very improbable. Under the Local Government Code, the New City would not have any authority to administer and enforce our Covenants. However, our Covenants would still be in force requiring the three Associations that were dissolved in in 2010 to be reinstituted. This would require the election of new Boards, increased administration, legal and accounting cost as well as the return to the old days of non-deductible property owner assessments. Why Should Voters Vote in Favor of Incorporation? So why should we wish to become a city? Well, first and foremost, we wish to protect ourselves from annexation by the Cities of Houston and Conroe. They would love to have our tax base and, like Kingwood, we would get little in return. But, we have until November 2057 before our agreements with Houston and Conroe end and we are at risk to be annexed. Obtaining greater control over our road system to prevent the type of thoroughfares proposed in the County Thoroughfare Plan could be another justification. However, such control is not absolute; if TxDOT believe such thoroughfares are critical to their state road system, they can trump the authority of any city or county. Improved connectivity to the Grand Parkway or the Aggie Toll Road could provide TxDOT with such justification. Unless a new Sheriff invalidates our current law enforcement model, I find it difficult to find other reasons to incorporate. For reasons outlined later, the New City will not gain much in the way of control over future development and growth, at least not as much as some would lead you to believe. What Should Be Our Eventual “End Game”? The Texas Constitution requires we first incorporate as a General Law City. But, this should not be our ultimate objective. To maximize our degree of self-governance, we should move to become a Home Rule City as soon as possible. What is the difference between these two forms of cities? General Law Cities are those municipalities with a population of 10,000 or less. The Texas legislature not only prescribes how these cities will be incorporated but also their specific powers, duties and form of government. A General Law City has no authority to act unless the State Legislature gives them the specific authority to do so. What will be the impact on our governance structure of becoming a General Law City? Unlike Home Rule Cities, General Law Cities only have the power and authority explicitly granted to them by statute. For example, General Law Cities can only have an elected Mayor and five council members. Without special dispensation by the Legislature, A General Law City cannot enforce or administer Covenants and Deed Restrictions. A Home Rule City derives its authority via a Charter developed by and approved by the voters. A Charter may not contain any provision that is inconsistent with the state constitution or statutes, a restriction leaving these cities with more “home rule” than the cities of any other state in the nation (according to a report by the Advisory Commission on Intergovernmental Relations). A General Law City and its governing body must be formed by the voters. Once incorporated as a General Law City, the voters can then separately vote to become a Home Rule City and in so doing adopt a Charter. The Local Government Code dictates the process to be followed in developing the initial city Charter as well as amending it once approved by the voters. Developing a draft of a Charter requires the City Council to approve by a 2/3rds vote calling an election for the voters to approve a Charter Commission and, in the same election, chose the members (at least 15 members) of the Charter Commission. An alternative exists for the City Council to form the Commission and select its members. Developing a Charter can become a very political and polarizing activity. In order to obtain support for a Charter we need to have a broad support and the size and composition of the commission will be critical in this process. So how long after becoming a General Law City will it take to develop a Charter and hold a follow-on Home Rule city election? What limitations as a General Law City do we have to live with until this change can be approved by the voters? Within the Home Rule form of government, voters have a range of other options to choose from, with the three most common being (1) council-mayor (strong or weak mayor options); (2) council-manager; and (3) commission. The Charter may also specify such items as number of Councilman to be elected and whether at large or by district, term limits, debt and spending limits. What Would a Path to Incorporation Possibly Look Like? The Texas Constitution requires we incorporate as a General Law City, the most restrictive of any form of city in Texas. But, The Township does not fall within any of the population brackets set forth to become a General Law City. It is critical that we eliminate as many legal ambiguities as possible to reduce the likelihood of a successful challenge to or appeal of an election. Someone could challenge the election as only being a referendum not an actual incorporation. Without additional statutory clarity, The Township, a Special District, cannot dissolve itself as long as it has any debt. Thus, upon incorporation, and subsequent election of a Mayor and City Council, both the Township and New City will continue to exist with their separate governing bodies. Legislation is needed to 1) expressly empower the New City to assume all the assets and liabilities of the Township and 2) clarify that The Township may be dissolved upon such action. Modify our current enabling legislation to provide that upon incorporation the New City can retain our existing 1% General Sales Tax. 1% Economic Development Sales Tax and our Hotel Tax. Without such an exception, The Township will lose all or a portion of approximately $55 million in revenue until subsequent elections can be held, assuming voters approve reinstituting these taxes in some form. The objective of all these discussions and analysis was to develop our legislative proposals for the 2017 Legislature. The outcome of this legislative initiative will 1) determine if future legislative action is still needed and 2) allow us to eventually develop new financial projections needed to educate the voters. 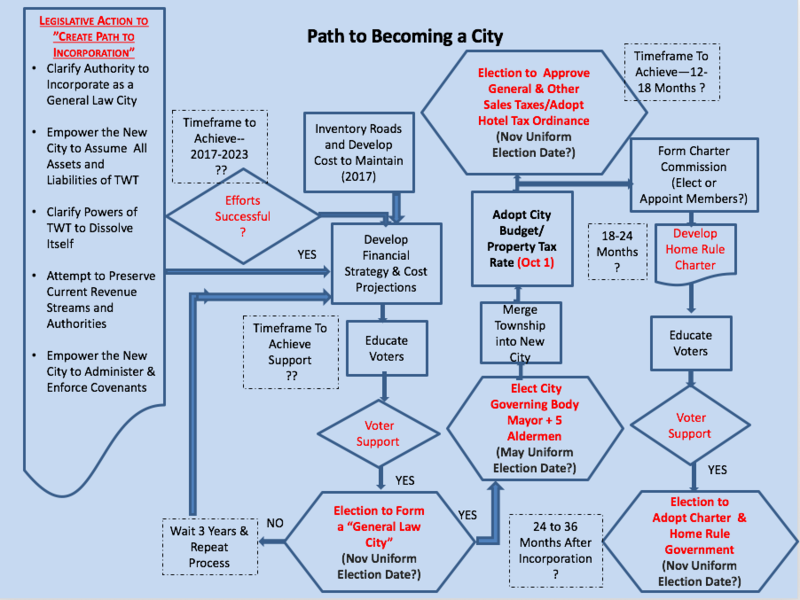 Our Path to Incorporation also must consider many other aspects of becoming a City, such as whether the voters wish to have a City Manager, as we do today, adopting a new Budget and Property Tax Rate and eventually move to fill self-governance by becoming a Home Rule City. Click here to download a powerpoint showing the path to become a city. What Would Be the Cost to Incorporate? The short answer is that we do not know. Until we determine how successful we are with our legislative strategy we cannot realistically estimate all of the costs or revenue of a New City. For the average resident, the primary concern in 2012 was the estimated higher city property taxes they would pay. 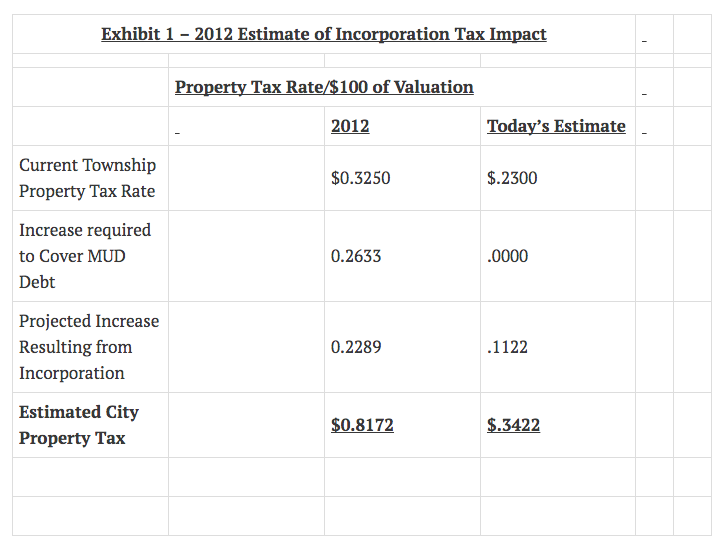 Exhibit 1 summarizes the property tax estimated in 2012 – $0.8172 – assuming the New City also annexed all of the MUDs within its boundaries. We have found the 2012 assumption that the sales tax and hotel revenue streams, approximately $57.4 million in 2016, would automatically rollover to a New City is not valid. Without some sort of legislative exception, these taxes would have to stand the test of the New City holding new elections to adopt such taxes. Before such elections could be held, the Township would have to be dissolved. Even if these taxes are re-authorized by the voters there would be at least 3 to 6 months where such revenue would be forthcoming. We also know that the Hotel tax, $8.2 Million in 2016, could not be sustained. We would lose at least the $2.1 Supplemental Tax and the flexibility of how we use the HOT today. In the absence of this sales tax revenue, property taxes for the New City would have to be even higher than that shown above. Some people say becoming a city would allow us to have more control over development. Having served in a General Law City before as the Chairman of its Planning and Zoning Commission, what could actually be done will probably fall short of what most expect. To take effect and have any standing over our Covenants, city ordinances would have to be more restrictive than our Covenants and even then could not cover every area covered by the covenants today. Most of the undeveloped property in The Woodlands is owned by Howard Hughes. These properties have in effect already been zoned through the use of Intended Land Use Documents (ILUD) for each property. Thus, city zoning regulations will have little impact on how residential and commercial properties are zoned as these properties would be “grandfathered.” The City could place more restrictions on what type of businesses are allowed where. But, it would need to be careful such restrictions are not viewed as an “economic taking” of property. So in closing, let’s be smart and do as much as we can to prepare a path for eventual incorporation and mitigate any risks and future costs. But in doing so let’s consider all the complexities, taxpayer risks and the cost of making such a decision. Preparation does not mean we have to rashly jump into making the decision until we are absolutely prepared and have to do so.